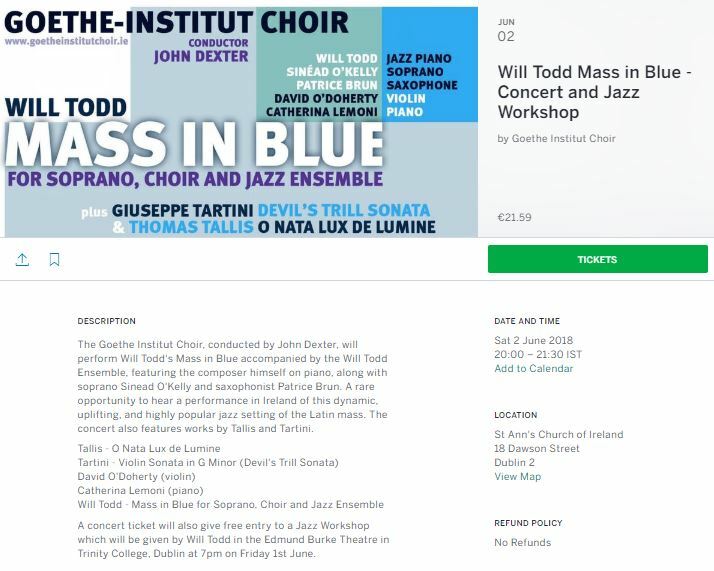 The Goethe Institut Choir, conducted by John Dexter, will perform Will Todd’s Mass in Blue accompanied by the Will Todd Ensemble, featuring the composer himself on piano, along with soprano Sinead O’Kelly and saxophonist Patrice Brun. A rare opportunity to hear a performance in Ireland of this dynamic, uplifting, and highly popular jazz setting of the Latin mass. The concert also features works by Tallis and Tartini. This entry was posted in Blog on May 21, 2018 by DCC Admin.